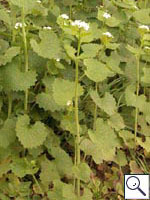 Garlic Mustard (A. petiolata) is the only species of Alliaria recorded in Britain. It is a native species. The BSBI provide a downloadable plant crib for Brassicaceae. Seven British miners are recored on Alliaria. A key to the European miners recorded on Alliaria is provided in Bladmineerders van Europa. 1a > Stem-mine: An external stem mine. Pupation in mine. On Alliaria in Britain and on Alliaria and Cardamine elsewhere. Uncommon. London (Hampstead) (Spencer, 1972b: 27). Continental Europe (Spencer, 1990: 83) including Germany (Dempewolf, 2001: 74), Czech Republic, French mainland, Lithuania, Slovakia and Spanish mainland (Martinez in Fauna Europaea). Ophiomyia alliariae Hering, 1957 [Diptera: Agromyzidae]. 1b > Leaf and stem mine: Oviposition takes place in the leaf blade where a short mine is formed until the larva reaches the nearest vein which is then followed downwards, with the main feeding occurring in the mid-rib, petiole, or in young plants, also in the stem (Spencer, 1976: 490). Pupation either internal or external. On Brassica, but not yet on Alliaria, in Britain and additional genera of Brassicaceae, including Alliaria, elsewhere. Widespread but only recorded from Warwick, Dunbarton and East Lothian in Britain. Also recorded in the Republic of Ireland, continental Europe, Egypt, Canada and the U.S.A.
Phytomyza rufipes Meigen, 1830 [Diptera: Agromyzidae]. Polyphagous. On more than 40 host genera in 15 families, including Brassica and Capsella, but not yet on Alliaria, in Britain. On Alliaria elsewhere. Widespread throughout Britain. Also recorded in the Republic of Ireland. Widespread in continental Europe. On 119 plant genera in 31 plant families of which only 4 plant genera in 2 plant families, but not yet on Alliaria, in Britain, although it is recorded on Alliaria elsewhere. Local, probably introduced to Britain. Widespread in continental Europe particularly in Botanical Gardens and glasshouses. Also recorded in Egypt. 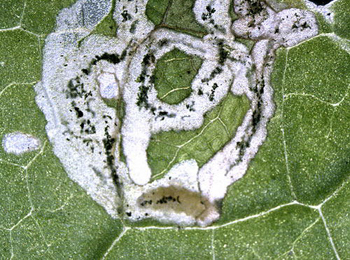 1e > Leaf-miner: Corridor-blotch mine, normally dorsal; usually whitish; in small leaves it lies characteristically in the centre of the leaf often touching the petiole; in larger leaves it lies to one side of the mid-rib. Frass deposited in green clumps near the leaf margin. Pupation usually external, sometimes in a separate pupation mine. 1f > Leaf-miner: Mine linear, whitish, both upper and lower surface. 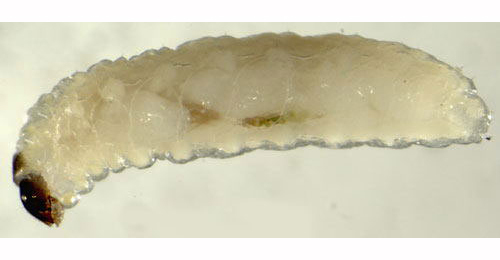 Pupation internal, at the end of the mine with the anterior spiracles projecting through the epidermis (Spencer, 1976: 433). Chromatomyia horticola is recorded on 160 plant genera in 31 families of which 55 plant genera in 19 families, including Alliaria, in Britain. 1g > Leaf-miner: Rather small, untidy, full depth, often branched corridor, often close to the leaf margin. Sides irregularly eaten out. Frass in a greyish-green central line that is interrupted from time to time, sometimes partly in strings. In times of rain the frass may run out and appear greenish. Usually several mines in a leaf (Bladmineerders van Europa). The body is whitish; head greyish brown with Y-shaped lighter marking. Pronotum with a pair of brownish shields. The mandibles have two teeth (Bladmineerders van Europa). Polyphagous. On numerous genera and species of Brassicaceae, Capparaceae, Resedaceae and Tropaeolaceae, including Cochlearia, but not yet on Alliaria, in Britain and numerous Brassicaceae, including Alliaria, elsewhere. Widespread in Britain and continental Europe. Also recorded in the Republic of Ireland.